June 29, 2014 · by Zack Reyes · Post may contain affiliate links. See my disclosure policy here. We've seen some new Clever Girl coupons coming out lately. One of the best places to find Cover Girl coupons is in your monthly P&G saver found in your Sunday paper. These are usually found in the first Sunday paper of the month. For as long as I can remember, these P&G inserts have contained Cover Girl coupons. A favorite Cover Girl product for them to release coupons for is their Lash Blast mascara. There always seems to be a coupon for that stuff in the P&G Saver. Where else can I find Cover Girl coupons? You can also find Cover Girl coupons online at sites like this one. To find out of Cover Girl coupons are available, and to see other makeup, beauty, grocery and household coupons are available, click here. Cover Girl coupons are always changing, as Cover Girl is always coming out with new products for their line. They will generally try to push sales for the new product with promotions such as coupons. Also be on the lookout for store promotions and deals at the same time. If you see a store sale or promotion, double up your savings by using your Cover Girl coupon on top of that sale. This is also why I encourage you to print Cover Girl coupons if you see them on the internet. You never know when coupons will disappear, so printing them right away when you see them is the only way to ensure that you will have that coupon when you need it for a sale or promotion. You don't want to be wishing you had the coupon when an awesome sale comes around that could mean you may have gotten the product for free or for a very low price. 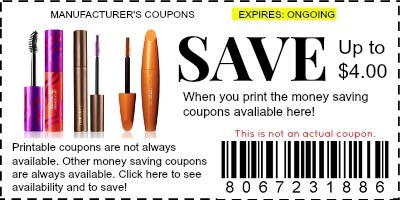 Keep your eyes out for Cover Girl coupons stuck to products as well. These are called peelie coupon and Cover Girl occasionally puts those out as well. If you came to the store with coupon in hand, but find peelie coupons that are of a better value, use those instead! Overall, Cover Girl coupons are so abundant that I don't really recommend buying any Cover Girl products without a coupon. They're so easy to get your hands on and it's like free money - why wouldn't you! ?